Whether it is in precious metals, raw materials or energy, the US mining industry is an essential part of the nation’s economic growth. And in some sectors, operating hours stretch into the night; it’s a big ask on the machinery, so constant maintenance is needed. The pressure to keep up with production demands can also put pressure on the workshop, so you need to make sure that the workshop is as safe as it is efficient. To keep machinery rolling and to comply with OSHA regulations, use maintenance platform solutions from SafeSmart Access. 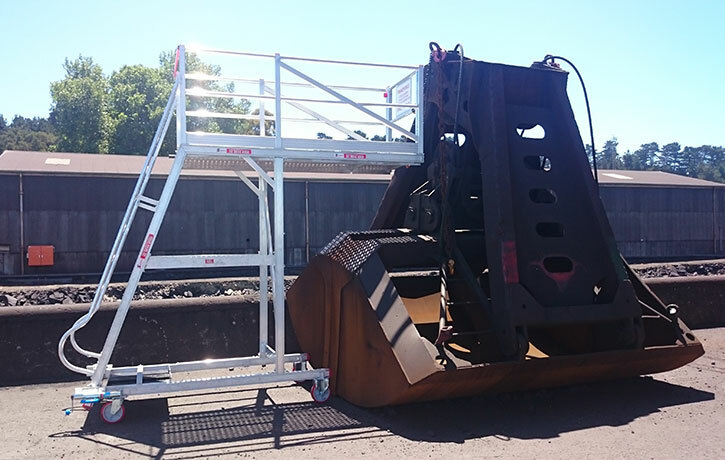 For gaining access around all mining equipment and structures, and for the ultimate safety whilst working at height, get in touch with SafeSmart Access today. Strategically located in New York and Los Angeles, we service all of America, with onsite consultations, custom platforms design and delivery. Make SafeSmart Access your partner in safety and efficiency for proper cost-effective machinery maintenance. Platforms – from a maintenance platform to a height adjustable solution that is east to wheel around by hand. Portable stairs – from a basic design to something more customized, easy and safe access to vehicles and machinery is assured with our range of portable stair options. Ladders – it may seem simple enough, but in heavier industries, all equipment needs to be compliant and tailored to your needs – heavy duty ladders for quick machinery maintenance access to lightweight yet rugged fiberglass options for electrical safety. Customized Solutions: Unique Equipment for Unique Access Needs. SafeSmart understands that in mining there can be some irregularly-shaped machinery and vehicles. They need safe access that complies with OSHA regulations, too. With our custom shop capabilities, we can come to site, assess your needs, draw up an original design for a maintenance platform that suit your needs perfectly, manufacture your product, and deliver it to site. Get in touchwith a representative today to discuss your non-off the shelf needs. If you have any enquiries, please get in touchwith SafeSmart Access today.